One of the worst accidents in regional history occurred at Revere Massachusetts in 1871. An Eastern Railroad express train collided with a local train, telescoping the wooden coaches and killing 29 people. On August 26, 1871, an express train smashed into the local at the station in Revere. The scene was horrific. The express was headed for Portland Maine, and was traveling at the then great speed of 35 miles an hour. The express train had rounded a curve with its engineer unaware of the local train, and was unable to stop in time. The engineer reversed his locomotive, whistled a braking signal, and then jumped off the train at the last moment. "I was standing in the front part of the rear car looking out the door on the platform. Suddenly I heard a rushing noise and great commotion in the car, and looking round saw the crowd of passengers rushing over the seats and through the aisle, and the locomotive coming like fury after them. The next moment I was driven out the door and, somehow, under the cars, and I plunged along some little distance, half conscious and half unconscious. I was finally brought up by a pile of broken timbers, and crawling out, I found I wasn't much hurt. I turned to and helped the crowd get out my companions in the wrecked car less fortunate than I. We pulled off the roof, finding the imprisoned could not be got out by any other way, and then saw the awful sight. The dead and dying were piled on to each other, wedged into the sides of the car and under and on top of the boiler. On top of the boiler were a dozen or so dead." The accident occurred as a result of many unfortunate events happening in sequence. There was a camp meeting that day at Hamilton Massachusetts, which greatly increased traffic and caused much confusion along the line. The local train departed 20 minutes late from Boston due to the adding of coaches. The station-master at Boston was instructed by the superintendent to inform the express train engineer about the local train ahead, but only informed him of a preceding Saugus Branch train. The local train conductor placed lamps on the back of the train at Revere to alert the express train, but did not place a lantern 1/2 mile down the line to signal a delay. The engineer of the express train had slowed for the Saugus Branch train to switch off, but increased his speed significantly as he proceeded to Revere. A jury placed the blame on the local train conductor, express train engineer, Boston station-master, and also officers of the company. The Eastern Railroad was found to have inadequate rolling stock in place for excursion traffic, and that better safety devices should be put in place including installation of telegraph lines, adding a siding at Saugus Branch, and the removal of kerosene lamps inside coaches. 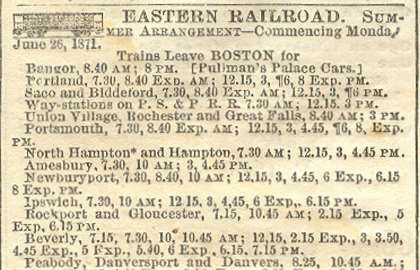 The train schedule below is from the September 5, 1871, Boston Daily Evening Traveller. Please note the scheduled departure times of the Beverly local train (7:15 pm), and the Portland express train (8:00 pm). More detail about the Revere Disaster of 1871.